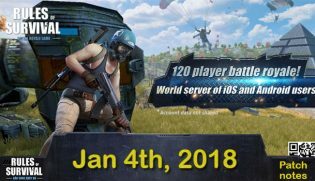 Rules of Survival game continues to experience a new update on Jan 17 with new stuff to find out. So make sure you won’t skip this new update because there are lots of nice things you should learn. 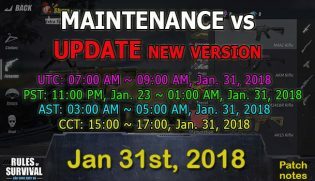 But before getting deeper into the update, don’t forget to check the maintenance times to see when it will happen in your area. The accomplishment time is an approximation. It can take longer than it said above. But the developers will attempt to get back up sooner. You are able to rename your character now! With this rename feature, you can switch your names under Rank in the Stats tab easily. But you should remember that you are allowed to alter your name once a month. Let’s start to set a new name now! You can lean left and lean right easily! The lean feature can be allowed in the Operation settings tab, also, you can change the position of every button, size, and transparency in the Custom tab too. Chicken Grenades were included in the game. They will deal higher damage in a broader range compared to the common grenades. Also, they are armed with special explosive effects. There are more two ways for earning Tokens. You can get them by sharing a look or trying to rank first in any mode. The Token Store now has some brand new items, also, the buying limit rules of the Token Store were enhanced. Elite Supply Boxes were included, this is a brand new kind of supply to get advanced looks. 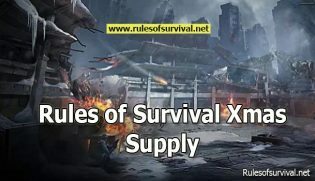 You can get Butler Set pieces through Elite Supply Boxes. Now you can check out a specific winter event Down Coat sale! Be sure to obtain nice discounts on down coats so you can stay warm during this winter. Remember that it has a limited time! There are two tabs added to the discount store, including Packs and Looks. Both of them will have common updates. The advanced supplies underwent an update! The Punk and Dark Rose Sets were gotten rid of from the advanced supplies. The Pure Preppy and Plaid Preppy Sets were included. 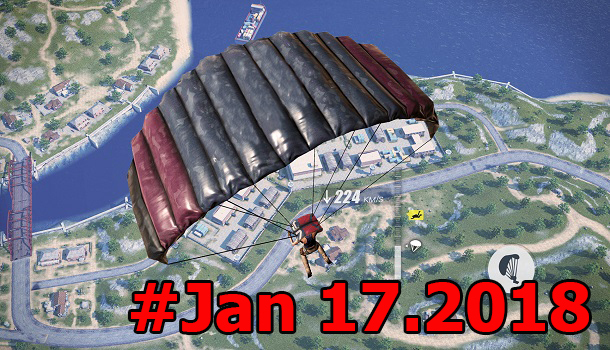 More boat spawn points by the shores of the island were included. The seating capacity of several vehicles was altered. SUV and Cars: developed to 5 players. Three-Wheeler: developed to 11 players. The throwing distance of throwable items was so much developed. Already solved a bug making the throwables unable to inflict damage on the vehicles. Made an optimization to the Spectate feature. The players are able to watch over the enemies who destroyed them. Grown the time the game operates in your devices background before disconnecting it. Solved some issues caused by Auto Pilot. Somewhat reduced the definition of cores left by the players who got killed already. Improved the image of pistol ammo. The Backpacks, Meds, and Throwables now have some customization options in the Custom settings tab. Made an optimization to the showing of the teammate markers on the map. You can see the number and status markers of the teammates easily. Developed the restriction of friends requests. Made an optimization to the random poses of the character in the lobby. Now, the players are able to log in the PC version and pay via scanning a QR code. Solved the bug making the players experience the module loading errors and giving them invisible collisions. Solved an error making the bulletproof unable to be shown after the players took off the headwear. Solved a bug making the explosion effects of flash grenades not be obstructed by the modules in the game. Solved a bug when some meds were shown continuously in the shortcut of meds. Solved a bug making the real number of some throwables unable to reduce after being utilized. Solved an error when the meds that were being utilized obstructed the sight of scope.